Night Beats’ third album start off promisingly enough with 'Celebration #1', where a spoken-word sample is followed by a driving beat and some freakout guitar. The spoken lyrics are almost beat poetry. It’s like the first Ash Ra Tempel album with the poem Howl on the sleeve and Manuel Gottsching’s guitar on the record. This, however, is as far out as Night Beats get as they return to their 60s garage roots for much of the rest of the album. It’s a shame because Lee Blackwell is an inventive and savage guitarist and is somewhat wasted within the confines of the three chord garage stompers on Who Sold My Generation. At times Night Beats seem to be taking us on a tour of the Nuggets boxset – there’s The Electric Prunes, The Seeds, even a bit of frat-party about 'Bad Love' with its sax and piano. When they do step outside of this, it’s just to mimic other 60s bands as on 'Egypt Berry', which starts off with a world music/psych riff that is reminiscent of the US Kaleidoscope. 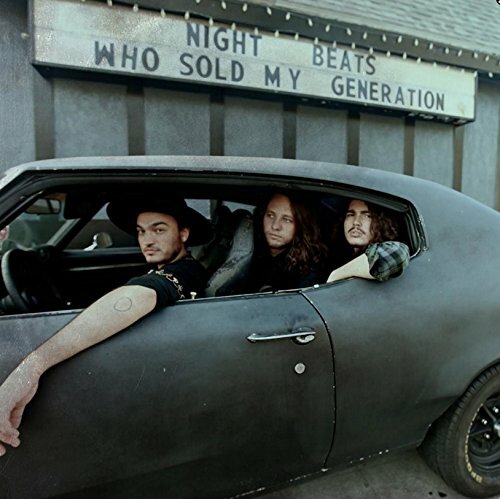 However, Night Beats aren’t total revivalists, there’s no period costume and the guitar sounds are often far beyond what Hendrix and Beck had at their disposal. The downside of this is that often, as on Last Train To Jordan, the sounds that Blackwell is getting out of his guitar are more interesting than the actual song. Night Beats might be happy to pay tribute to the music that they love but, for the listener, there’s not much incentive to investigate further beyond the few moments (Celebration #1, Last Train To Jordan) where they throw off the shackles of genre and get weird. Even then it’s hard to equate that band with the band that can also churn out the pure revivalism of Bad Love. I feel that Night Beats should (and could) be using the structure as a take-off point, much like Quicksilver Messenger Service.